What is the condition that you see in the photograph ? The reason for the defect to be in that particular locations is ? 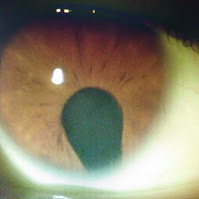 Coloboma originates from Greek word kolobos meaning cut short The attached photo represents a typical iris coloboma. It always appears in the inferior nasal quadrant and is the result of failure of closure of the embryonic fissure in teh fifth week of gestation. Note that the pupil is shaped like a key hole or inverted teardrop. Tyical iris coloboma may be involved with coloboma of the ciliary body, choroid, retina and optic nerve. Isolated colobomatous microphthalmos is inherited as AD trait in 20% of cases. Atypical iris coloboma can occur in other locations and are NOT associated with posterior colobomas.